I found that everytime I start the debugger, IDEA cleans the CALALINA_BASE/work/_scratchdir so that every JSP page needs to be parsed and compiled again, even when it is not changed since last run. This feature greatly slows down my job. I wonder if there is a way to void this? As far as I know, when Tomcat starts again , it will see if the Compiled JSP classes are older than the JSP source, and passed by those are not. compiled again, even when it is not changed since last run. No! How could I ! hehe, my project have over 1000 JSPs, it'll take some hours to Validator them all. I investigate the situation once more yesterday. I found out that when idea start debugging webapp, it first creates a "UNIQUE dir" in IDEA installation path. The dir contain a "conf" dir, where server.xml and web.xml are placed in. Then idea set the CATALINA_BASE to the "UNIQUE" dir and use the generated configuration to start the container. After that it performs an unreasonable action : to delete the "work" directory which contains the generated java and class file for JSPs. I think it is hardcored in IDEA for this, at least i didn't found any settings can change it. This results in the slowness. Assume that your webapps login-page contains serveral struts tiles, and you need to Parse and Compile all of them when you restart debugger and login. Only after that, could you get to the page you want to debug. Have I made myself clear? Sorry for my poor poor english. i must declare that i didn't mean that idea compiles jsp for me on building the project. I mean that after start the debugger, and when the servlet container (tomcat) is already running, and when you open a page in your browser for the first time, the JSPs is compiled by the CONTAINER because IDEA clearned the cache. I thought that "feature" was fixed with the move to Jasper2. >> No! How could I ! >> contain a "conf" dir, where server.xml and web.xml are placed in. >> you get to the page you want to debug. >> Have I made myself clear? Sorry for my poor poor english. just wish they could disable the behavior for TC 5. >i must declare that i didn't mean that idea compiles jsp for me on building the project. I mean that after start the debugger, and when the servlet container (tomcat) is already running, and when you open a page in your browser for the first time, the JSPs is compiled by the CONTAINER because IDEA clearned the cache. Thanks for your reply. I finally solved this problem. That isn't a tough mission. All I did is decompile the tomcatIntegration.jar and removed some lines. I really understand this, but I'd rather do the syn by myself, compared to the slowness. serious side effects of it, which I have no doubt you will soon run into. Oh, thank you! This is what i longed for!! Sorry, but i searched this forum for "jsp" "tomcat" and some other keywords only finding nothing that you mentioned. Could you please show me some? The reason that I want to keep the ]]> in my original "server.xml" is mainly about the "manager application" of tomcat4.0.6. Unlike in tomcat4.1 (i don't use version 5 because of the undergoing project), the manager application is deploy using war file, and there must be a privileged="true" in the server.xml for its context. So when Idea removed the definition, it can not be used to reload my webapp. Also for this, when I changed the servlet or struts class of my webapp, i often have to stop tomcat and restart it again (Reload changed classes is not always work). Then I suffered the "Cleaning of the cache". So I wish to change it. In my opinion, the "Compare the timestamp of the JSPs and the Generated Java file, and ommit the unnessesary work" is the Container's Feature. Why not leave the problem just where it belongs. I know there maybe problem. Actually if you made the generated Java file's timestamp "IN THE FUTURE", nothing will happen when you modify your JSPs. If this is the problem you mention, I think an experinced developer will soon find the problem and manually delete the "work" dir. That's all. If you would tell me where I was wrong by the above, I will be very happy. sure what is gained by keeping them. The reason that I want to keep the <Context> in my original "server.xml"
removed the definition, it can not be used to reload my webapp. deploy that with your war file? >> compared to the slowness. >Oh, thank you! This is what i longed for!! 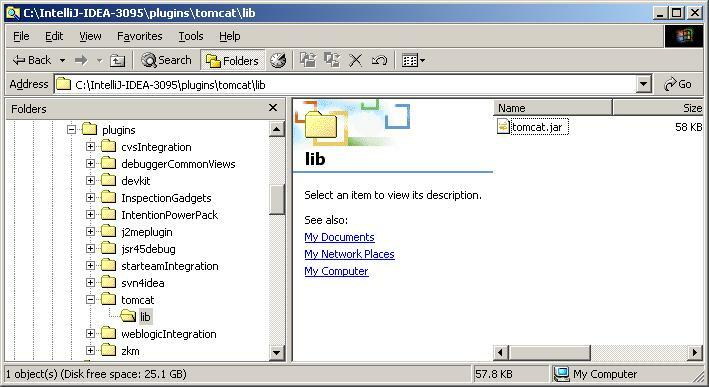 oh, just replace the jar file in \plugins\tomcatIntegration\lib with the new one, and enjoy it! need to remove their whole path. >oh, just replace the jar file in \plugins\tomcatIntegration\lib with the new one, and enjoy it!